Union Public Service Commission conduct Civil Service Main Examination every year. 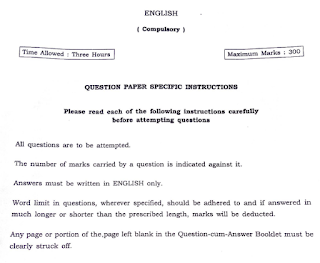 Now you can see the question paper asked by UPSC. Union Public Service Commission Takes Civil Service Examination every year. And almost 10 lakh student apply for this and apx 4 to 5 lakh take part in exam. Candidate who clear Tier I exam will shortlist for Tier II exam. Now what kind of exam is this. Candidate can download English Language Exam (Paper B) from the link given below. Candidates can also download/read General Studies Paper I,II,III,IV from the previous post. To download this, please click on the link given at the end of this post. Click here to Download English Subject UPSC CSE Mains Exam.